Retro seems to be the theme of my weekend. First a cozy tea nook for two and now a living room inspired by the same era. 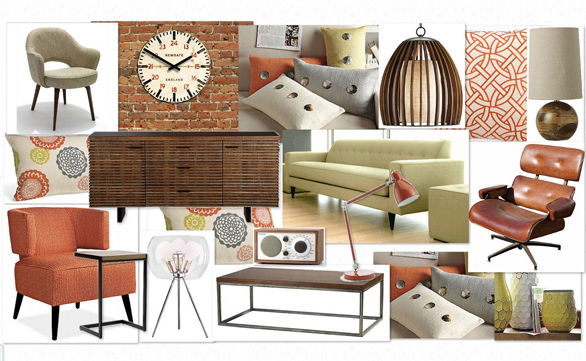 I’ve had plenty of items to choose from, since retro inspired decor has been making a comeback for a few years now. I think one of the easiest ways to channel a look from the mid-twentieth century is through the use of colour. The palette used in this olioboard is a throw back to popular colours from that era. You can also try using candy apple red, aqua and hits of chrome to achieve a retro vibe. To complete the look, try using furniture with angled, tapered, circular legs as seen on the Knoll Armchair and sofa. Also, take some time to find accents with a bit of retro flare like the glass shade tripod lamp, Eames Lounge Chair and playful, retro patterns. The hardest thing to do when creating a design like this, is to not go overboard. Every item in the room does not have to be from or inspired by the particular era. Just get a few key pieces and a great colour scheme and you’re good to go.